Hi folks! it's Toni here and I'm sharing a little Halloween themed canvas. We never used to pay much attention to Halloween when I was growing but it's now big business here in the UK. Last year was the first time I'd hosted a Halloween party for some of my nieces and nephews. It was great fun and I'd love to do the same again this year ! With that in mind, I've made a start with this home decor piece. This canvas board measures 5" x 7" and is just a nice size for a quick make. As usual, I started off by giving the board a quick coat of gesso. 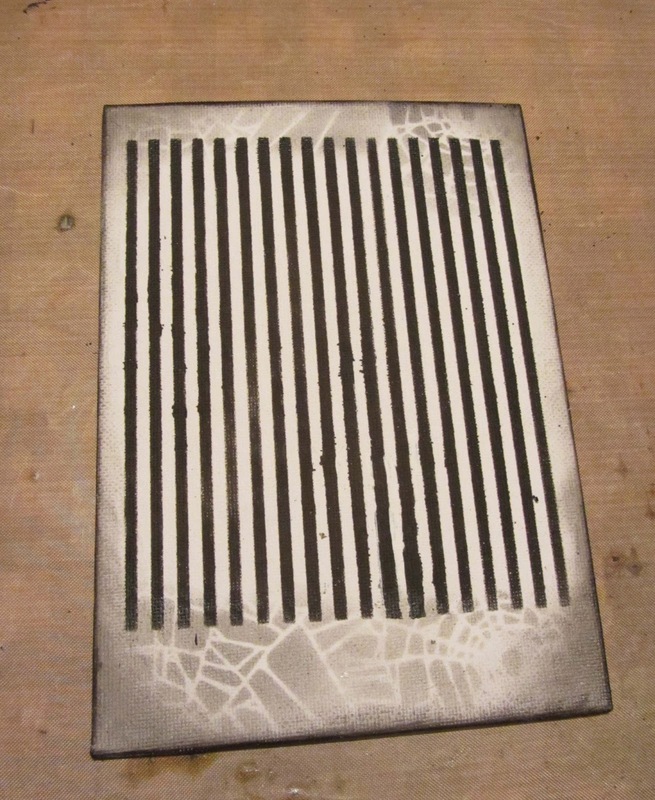 I then used Wendy Vecchi's Yikes....Stripes stencil with Black Soot Distress Paint and applied the black paint with a blending tool. 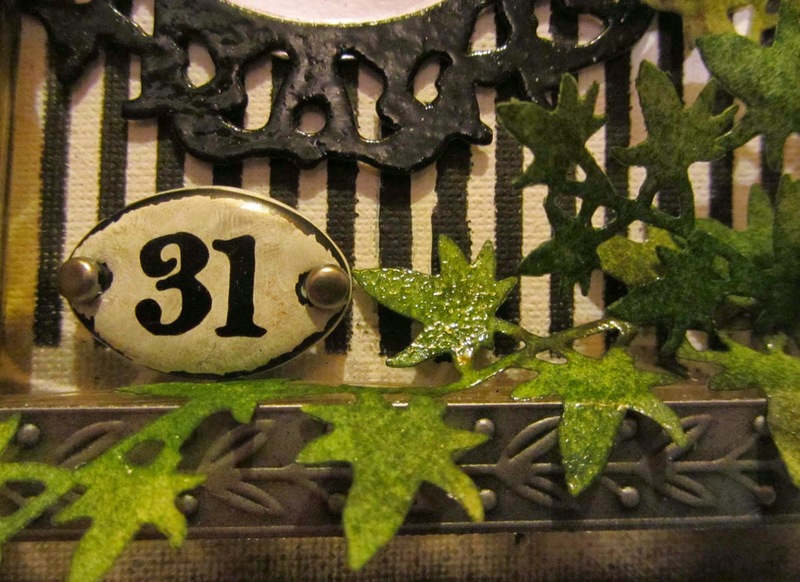 Once this was dry, I added some further stenciling, using a Tim Holtz 'Shattered' Layering Stencil. This time. I used Black Soot Distress Ink so that it was a little more subtle. I also blended some ink around the edges and used a heat tool to set it. 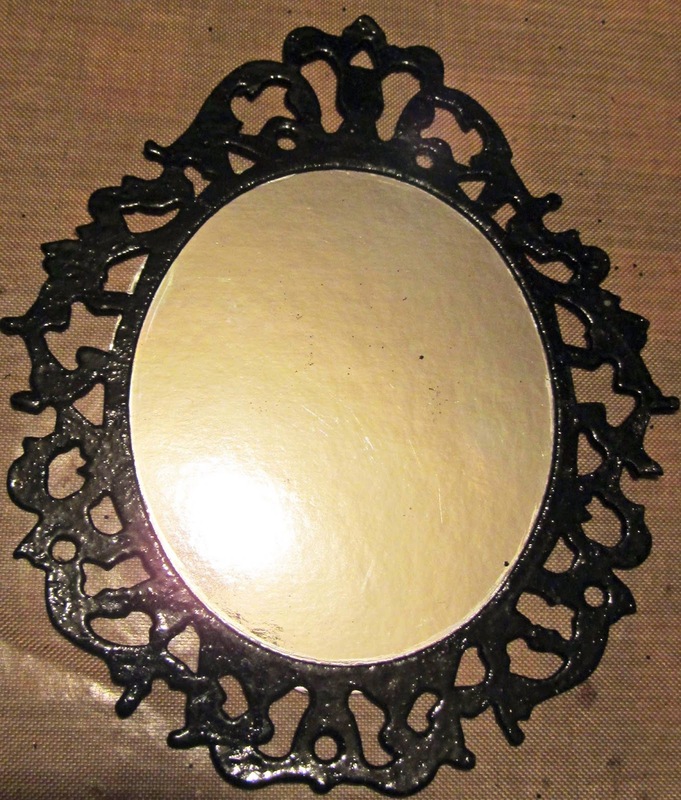 I die cut the mirror frame using an Alterations Ornate Frame die. I used black card and then applied Distress Embossing ink and clear embossing powder. I adhered a piece of mirror card to the back. It was difficult to capture the shiny effect in a photograph, without getting a reflection of me and my camera ! I created a little shelf underneath the mirror by adhering several strips of dimensional tape on top of each other. I then covered the tape with a strip from Tim's Industrious Stickers. If you'd like to have a go at something like this you'll find some of the products I've used in the lovely eclectic Paperie store. Just click on the links below and you'll be transported straight there. SPOOKTACULAR, Toni! LOVE the shine from the clear embossing powder! LOVE the mirror, frame, and shelf you created! GREAT Halloween decor! what a great Halloween decoration Toni! love the stripes, the mirror and sweet little shelf holding the bottle and rose - so fun! 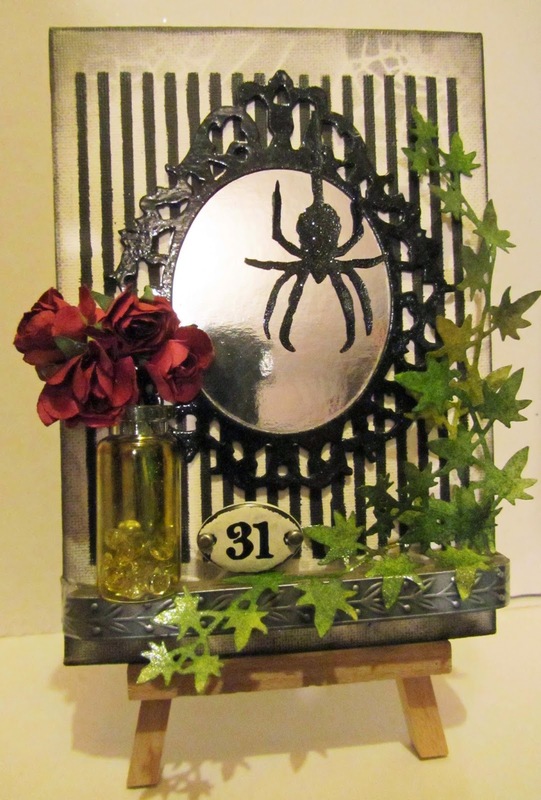 Wonderful make, love how you did the mirror with that little shelf, very clever! Wow Toni, what a fabulous make! I don't like spiders but use them all the time at Halloween - love how you used this scary one! !